The thin ice on Greenland’s coast is melting. But so what? The thick ice at high altitudes is growing. Overall, Greenland is losing more than 200 billion tons of ice a year. Scientists around the world report that Greenland is losing ice overall, despite small ice gains at high altitudes. And what’s more, the losses have drastically accelerated in recent decades. Right now, Greenland is losing more than 200 billion tons of ice a year! The meltwater from Greenland’s ice sheet continues to contribute to global sea level rise. A rapidly warming climate isn't good news for Greenland or the rest of us. 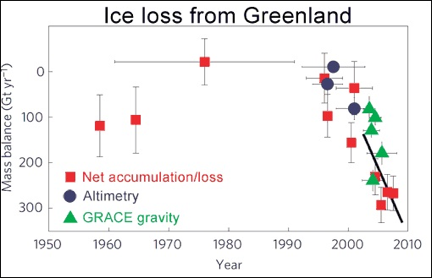 The best available science tells us that Greenland is losing ice extensively (Figure 1) and that these losses have drastically increased since the year 2000. Figure 1: Estimated Greenland ice sheet mass balance changes since 1950 using three different methods (Jiang et al. 2010). Mass balance measurement techniques are discussed here. Adapted by John Cook with permission from Macmillan Publishers Ltd: Nature Geoscience 3: 404-407, Figure 4b © 2010. The evidence suggested by a multitude of different measurement techniques suggests that not only is Greenland losing ice, but that these ice losses are accelerating at a rapid pace. Further evidence suggests that although ice losses have up to this point occurred primarily in the south and southwest portions of Greenland, these losses are now spreading to the northwest sector of the ice sheet. Although there have been some gains at high altitudes, significant ice losses are occurring at low altitudes along the coastline where glaciers are calving ice into the oceans far quicker than ice is being accumulated at the top of the ice sheet. In conclusion, Greenland is losing ice extensively along its margins where fast-flowing ice streams are pushing more ice into the ocean than is gained in the center of the ice sheet. For more information on how ice sheets lose mass, a more comprehensive discussion is available here.